“The fracking ban votes reflect the genuine anxiety and concern of having an industrial process close to neighborhoods,” Hickenlooper said recently in a prepared statement. The statement came after a tally of final votes showed residents in Broomfield successfully passed a fourth so-called “fracking ban” in Colorado. Fort Collins, Boulder and Lafayette voters passed similar bans by much wider margins earlier this month, but Broomfield’s vote was so close (10,350 to 10,333) that it has triggered an automatic recount. Christi Zeller, director of the La Plata County Energy Council, said the votes in Boulder and Lafayette are symbolic. Boulder County has some production, but the city of Boulder’s last gas well was plugged in 1999, she said. Hickenlooper said mineral rights need to be protected and that the four communities can work with the state’s chief regulatory agency, the Colorado Oil and Gas Conservation Commission, to mitigate environmental and health concerns. But Dan Randolph, director of the San Juan Citizens Alliance, said that Hickenlooper, as a former gas and oil industry employee, doesn’t get it. Randolph said there are legitimate concerns tied to gas and oil production. He cited health, water quality and noise. “There is no question that there is an increase of volatile organic compounds in the air during gas and gas development,” Randolph said. “There are and have been serious concerns elsewhere. This is not unique to Colorado. 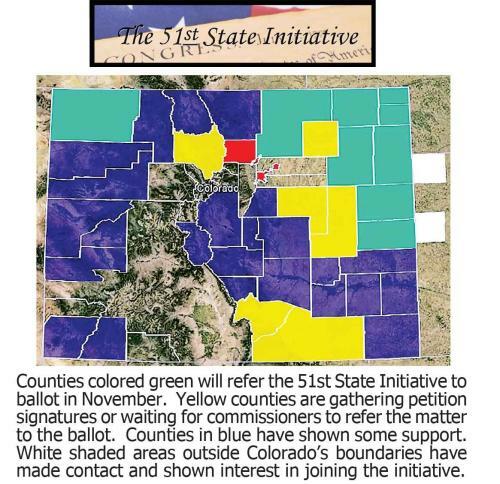 The 51st State Initiative: Weld County rural-urban divide issue overblown? If Greeley residents had not voted in last week’s election, the 51st state initiative still would have been shot down by Weld County voters, according to a breakdown of ballots provided by the Weld County Clerk and Recorder’s Office. Without Greeley voters included, 52 percent of Weld County voters would have chosen not to move forward with seceding from the state of Colorado, versus 48 percent who voted for the measure. The final count on the 51st state question was 56 percent of Weld County voters against secession, compared to 44 percent in support. In Greeley, voters strongly rejected the measure 67 percent to 33 percent. Some say the disparity between the way Greeley and the rest of the county voted points to a difference in values. Weld County commissioners last week said they feel the rural-urban divide also exists within the county. Others say the fact that Greeley voters rejected the 51st state by a wider margin has nothing to do with a disconnect. They point to the fact that the rest of Weld County also voted against the measure as reason to argue the rural-urban divide issue is overblown. Critics say Weld County commissioners may have a disconnect with the rest of their electorate. None of Weld County’s five commissioners responded to repeated requests from The Tribune seeking comment regarding how the county voted on the 51st state initiative. But commissioners said after Election Day that they put the question to a vote specifically to see what their electorate thought of secession. Commissioners said they would honor the vote of the people and would not move forward with seceding from the state, but they vowed to continue to fight for rural interests at the state level. They said the vote was still a success in the sense that a message was sent to state legislators and the governor that a substantial portion of people in rural Colorado feel they have lost their voices. “I think we have to be careful in saying that because they rejected the vote, there isn’t a problem,” Weld County Commissioner Sean Conway said last week. Commissioners also sent a letter to Gov. John Hickenlooper’s office saying they would like to find a time for him to meet with Ault, Fort Lupton, Tri-Town and Evans residents before the 2014 legislative session. “We received the Weld County commissioners’ letter and are reviewing the governor’s upcoming schedule to find more opportunities for the governor to visit Weld and other rural counties,” said Eric Brown, spokesman for the governor’s office, in a statement. He said Hickenlooper was in Weld County on Sept. 16, 22, and 23 and on Oct. 23, and has made an effort to visit with all Coloradans. Greeley Mayor Tom Norton, who has served as a state lawmaker, said he doubts the state Legislature is any more divided today than it was when he was a representative. Jeffrey Hare, a founder of the 51st state initiative and its spokesman, said he feels there is a disconnect between Greeley and the rest of the county. “I would say that it is a little unfortunate that the city of Greeley has forgotten its agricultural roots,” Hare said. He said he feels the fact 43 percent of Weld voters supported the initiative makes it a “resounding success.” Secession is still a new idea to many people, he said, but 43 percent is a strong plurality on which to build for a renewed secession effort in 2014. Hare said the five counties that did vote for the initiative — Kit Carson, Washington, Phillips, Yuma and Cheyenne counties — will meet Monday to discuss their next steps in the movement. While it was possible to track how the city of Greeley voted versus the rest of the county, other communities were not as easily identified. Ballots were not separated by precinct, but by blocks for different districts that held an election this year, said Rudy Santos, elections manager for the Weld County Clerk and Recorder’s Office. Hare’s suggestion that Greeley has lost touch with its agricultural roots was refuted by local officials. Sarah MacQuiddy, president of the Greeley Chamber of Commerce, said the city is anchored on the east and west by symbols of Weld County’s agricultural prosperity, with a JBS USA office to the west and Leprino Foods to the east. “I still believe people in Greeley very much so understand our agrarian roots and appreciate the fact that we are an agricultural county, and appreciate that economic impact,” MacQuiddy said. Steve Mazurana, professor emeritus of political science at the University of Northern Colorado who opposed the 51st state initiative, said he sees the differences between Greeley and rural areas of the county as a simple disparity in needs and behaviors. But he said that doesn’t stretch into a difference in ideas and values. For example, Greeley and Windsor residents probably lock the doors to their homes during the day. But that doesn’t necessarily point to a difference in values compared to rural areas, where the practice may be to leave them unlocked. That’s a difference in how residents are dealing with their surroundings, which is a fact of life in any state or county, he said. Mazurana said he feels there are just as many rural residents who are unwilling to accept incoming urban ideas and values as there are urban dwellers who rural residents say are attacking their way of life. Critics say commissioners are elected by all who live in Weld, including municipalities, and a dedication to only rural needs is a disconnect between commissioners and their electorate. But most of Weld County commissioners’ control is over unincorporated parts of the county, meaning they are rightly more sensitive to the needs of rural areas, Mazurana said. More 51st State Initiative coverage here. More 2013 Colorado November election coverage here. More oil and gas coverage here and here. Proponents of a failed move to secede from Colorado say they will now look to the legislature for help in giving their counties more political clout. Eleven rural Colorado counties voted Tuesday on the question of whether their commissioners should proceed with plans to create a 51st state. Phillips County was one of five counties where the non-binding measure passed. The other four counties were Cheyenne, Kit Carson, Washington and Yuma. Together, the five counties have a total population of about 29,200. The measure failed 58 percent to 42 percent in Weld County — population 263,691 — where the 51st state idea first gained traction. Elbert, Lincoln, Logan, Moffat and Sedgwick counties also voted against secession. Secession critic and retired University of Northern Colorado political science Prof. Steve Mazurana said the notion of breaking up with the Centennial State is all but dead. “Without Weld County, the efforts to secede will go nowhere, at least for the next decade,” said Mazurana. Schafer said the 51st state movement will now look to state lawmakers, including State Rep. Jerry Sonnenberg, R-Sterling, to advance a measure in next year’s legislative session to change statewide representation. Once such proposal is the Phillips Plan which would have representatives elected by county, rather than by population. But University of Colorado law professor Richard Collins said a series of U.S. Supreme Court decisions in the early 1960s cemented the “one man, one vote” concept into law. Those cases will block any move to put rural counties on par with urban counties, he said. The counties could also try to reshape the boundaries of legislative districts. But the Colorado Supreme Court said redistricting only happens every 10 years. Hickenlooper said he recognizes the frustration of the 51st state followers. Voters passed secession initiatives in five rural, northeastern counties, while six counties rejected them. Perhaps more important than how many counties adopted the proposal was one that didn’t — Weld, the most populous and economically influential county where secession was on the ballot. The five counties that passed secession measures have a combined population of 29,056. Even the least populous state in the nation, Wyoming, has 563,626 residents. Counties that rejected secession have 330,119 residents combined — 263,746 of whom live in Weld. The new course for the movement is already taking shape, and it doesn’t involve leaving Colorado — quite the opposite. Conway said the next step is modeled after the measure voters passed in Phillips County on Tuesday, which would add seats in the state Legislature from rural Colorado. That’s a tall order. It would require a constitutional change in the way legislative seats are apportioned. That would require approval by voters statewide. Before it could even reach the ballot, two-thirds of the Legislature or a sufficient number of petition signatures that would require plenty of urban support is necessary. Instead of fortifying the urge to shake loose, Conway says the secession experiment has reminded rural Coloradans of the need to embrace the rest of the state — and hope that it reciprocates. Town Manager Mike Scanlon said he believes town residents felt the time was right to restore a more natural bank of the Roaring Fork River and ease the flood threat. The project has been outlined and discussed for more than 10 years. A top goal for the town also has been to relocate residents of the Pan and Fork Mobile Home Park out of the floodplain. Studies show the neighborhood is at high risk of flooding. “I think a lot of people said it’s time to get it done,” Scanlon said. It probably helped that people saw work underway, Scanlon said. The town of Basalt had funding for the first phase of the project from existing funds. The ballot question asked voters for permission to issue $5 million in general obligation bonds to undertake a greater share of the project. The ballot question wasn’t a thumbs-up or -down on the project. The town already has started relocating residents of the 35 trailers that were occupied in the park, and a contractor is starting the first phase of the river work. Instead, the question sought the funds needed to finish the project more quickly. The ballot question gives the town permission to raise property taxes to pay off the general obligation bonds, but the Town Council and administration don’t anticipate a property tax hike. They contend the bonds can be repaid through the existing 1 percent sales tax for parks, open space and trails and money available in the general fund. The votes in four Colorado cities on fracking within city limits — in Boulder, Broomfield, Fort Collins and Lafayette — attracted attention far beyond the state’s borders in recent weeks as the nation debates the pros and cons of the widely used practice. And those involved say the issues raised by the campaigns will continue to be debated for months and years to come. Boulder’s anti-fracking measure was passing handily late Tuesday, while those in Fort Collins and Lafayette saw smaller margins in the “yes” column. Meanwhile, the yes and no votes on Broomfield’s fracking measure were fairly close late Tuesday, although at least one anti-fracking advocate — Sam Schabacker, Mountain West regional director for Food & Water Watch — appeared ready to concede defeat there. Doug Flanders, a spokesman for the Colorado Oil & Gas Association, an industry trade group, said his organization…will continue to work with communities about the importance of energy and energy development. • Broomfield: Question 300, which would have imposed a five-year prohibition on all fracking. 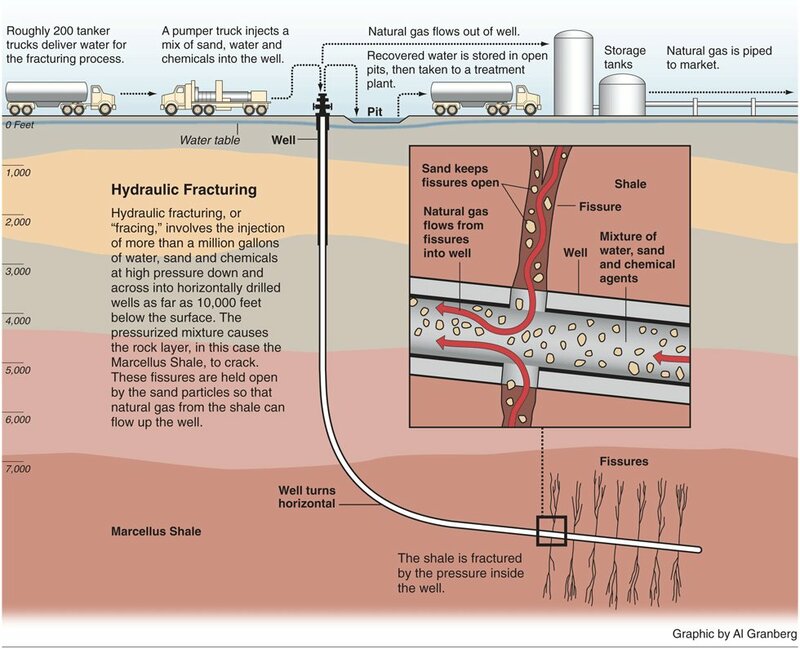 • Fort Collins: Its measure will place a five-year moratorium on fracking and storage of waste products related to the oil and gas industry in town. • City of Boulder: 2H imposes a five-year moratorium on oil and gas exploration.